Diphenhydramine blocks the effects of the naturally occurring chemical histamine in the body. 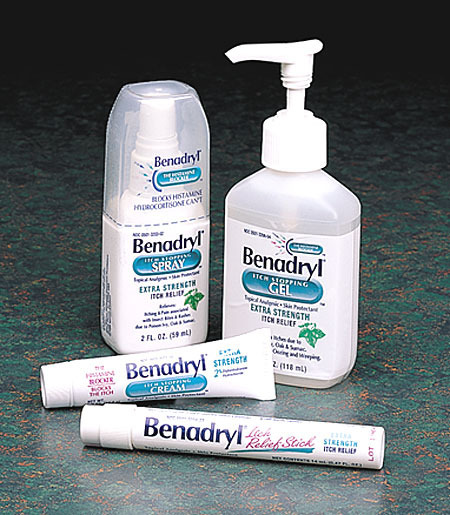 Benadryl is used to treat sneezing; runny nose; itching, watery eyes; hives; rashes; itching; and other symptoms of allergies and the common cold. Benadryl is also used to suppress coughs, to treat motion sickness, to induce sleep, and to treat mild forms of Parkinson's disease. 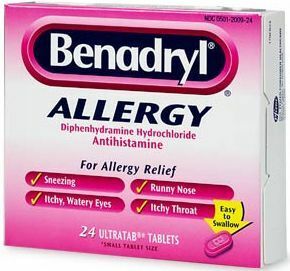 Benadryl is an antihistamine with drying and sedative effects. It relieves red, inflamed eyes caused by food allergies and the itching, swelling, and redness from hives and other rashes that are caused by mild allergic reactions. It also relieves the sneezing, coughing, runny or stuffy nose, and red, teary, itching eyes caused by seasonal allergies (hay fever) and the common cold. Antihistamines work by decreasing the effects of histamine, a chemical released in the body that narrows air passages in the lungs and contributes to inflammation. Antihistamines reduce itching and swelling and dry up secretions from the nose, eyes, and throat. Benadryl is also used to treat allergic reactions to blood transfusions, to prevent and treat motion sickness, and, with other drugs, to treat anaphylactic shock (severe allergic reaction) and Parkinson's disease, a nerve disorder characterized by tremors, stooped posture, shuffling walk, muscle weakness, drooling, and emotional instability. Diphenhydramine is an antihistamine used to relieve symptoms of allergy, hay fever and the common cold. These symptoms include rash, itching, watery eyes, itchy eyes/nose/throat, cough, runny nose and sneezing. It is also used to prevent and treat nausea, vomiting and dizziness caused by motion sickness. Diphenhydramine can also be used to help you relax and fall asleep. Benadryl is an antihistamine which blocks the release of histamine, a chemical in the body that narrows air passages in the lungs and causes inflammation during allergy reaction. By doing so Benadryl relieves red, itchy eyes and the redness and swelling from hives and other rashes that are caused by allergic reactions. 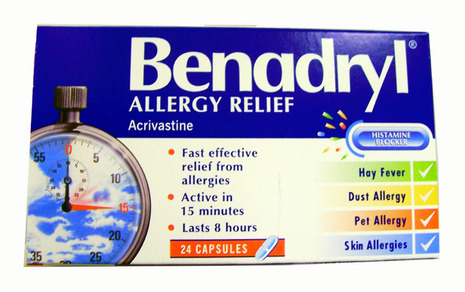 Benadryl also relieves the sneezing, coughing, runny or stuffy nose, and other symptoms of seasonal allergies and the common cold with drying and sedative effects. Benadryl is also used in patients Parkinson's disease, to treat allergic reactions to blood transfusions, insomnia and motion sickness.